Our field of specialization lies in a wide spectrum of varied web based services, business and technological solutions in a wide assortment of industrial fields. We have always made ourselves ready to help out in all sorts of online technological fields which include Search Engine Optimization (SEO), Website Design and Development, Online Marketing and ecommerce to the best of our abilities in order to simultaneously boost the growth and development of both our clients and us as a company. 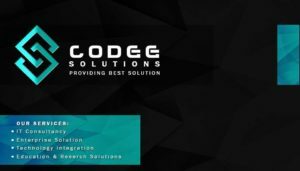 All of us here at Codee Solutions strive to make this company the biggest name in Multimedia, Branding and Information Technology service sectors and in the process increase our recognition all over the world. We have always worked hard give the very best in every field of service that we work on and in the process go one step closer towards achieving the above stated goal. All of our teams here at Codee Solutions use the principle of teamwork to work towards furthering our vision and use it to continue improving our services in the arena of website designing, web development and other such online services. Our teams consist of highly driven yet down to earth specialists and engineers who always try to perfect every project in order to meet every requirement and also assist them to the best of our abilities. Our client dedicated approach and prompt service helps us increase our efficiency and synergy to deliver better services and products and helps us complete projects in time and in order. © 2011 - 2017. All rights reserved .